"I have never allowed my duty as a gentleman to interfere with my pleasure in the slightest degree"
Oscar Wilde, "The Importance of Being Earnest"
Simply because a book condemned a practice did not mean that the practice ceased immediately after the book hit the stands. It was precisely because people were committing sins, large and small, that authors felt compelled to advise against them--usually with little effect. 19th Century American men were men, and were not significantly more virtuous than men before or since--despite the preaching of moralists and etiquette writers. The following page discusses a few of the Victorian gentleman's sins and, when applicable, describes some means whereby they may be properly committed. This includes the rules to several popular card games of 19th Century America. "A man doesn't think he had a good time unless he has a headache the next morning"
"The hardest part about the 'next morning' is not the headache; it's the effort to recall what particular story you told your wife the night before"
"A man seldom escapes temptation because he is so careful not to let any interesting temptations escape him"
"It must be awful to live with a man after you have reformed him and he has become so superlatively good that you don't feel superior to him anymore"
"College boys are addicted to cigarettes and flirtations, bachelors to cigars and sweethearts; it takes a married man to get real joy out of anything so economical as a pipe or a wife"
Social pleasures, carried to excess, expose young men and women to danger of moral corruption and physical disorders. The feast, the dance, the social glass, immoderately indulged in, with late hours and evil associates, have often wrought ruin to the pure and good". "Sometimes people get a habit of spitting--which they do with much noise as though it gave them an air of importance. The inhabitants of the United States are notorious for it. It accompanies the bad custom of smoking or chewing tobacco...that anyone should allow such a habit to grow upon them is very surprising". 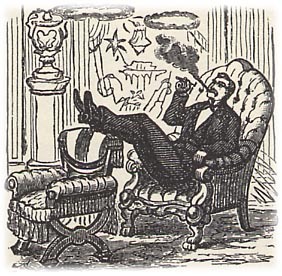 "I remarked one young man, whose handsome person, and most elaborate toilet, led me to conclude he was a first rate personage, and so I doubt not he was; nevertheless, I saw him take from the pocket of his silk waistcoat a lump of tobacco, and daintily deposit it within his cheek". "Doctor,"said an old gentleman, who was an inveterate snuff-taker, to a physician, "is it true that snuff destroys the olfactory nerves, clogs and otherwise injures the brain?". "It cannot be true" was the caustic reply, "since those who have any brains never take snuff at all". "Few women understand, at the outset, that in marrying, they have simply captured a wild animal, and staked their chances for future happiness on their ability to tame him. He is beautiful physically very likely, of pleasing manners and many external graces, and often possessed of noble qualities of mind and heart; but at the core of his nature he cherishes still his original savagery, the taming of which is to be the life work of the woman who has taken him in charge."